Atlantic Sessions will mark its 10th anniversary from November 15 to 18 this year, with live performances from Northern Ireland’s finest musicians in some of the Causeway Coast’s most unique landmarks. In celebration of its 10th anniversary, Atlantic Sessions have invited four guests to curate headline events. In addition to showcases already announced by Joe Lindsay and Ralph McLean, it was further revealed that BBC Radio 1’s Phil Taggart and Third Bar’s Gary Lightbody and Davy Matchett have curated headline Friday and Saturday events. 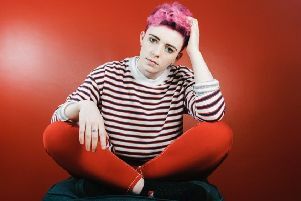 Showcase artists throughout the festival include All Tvvins, Anthony Toner, Arborist, Arco String Quartet, Brand New Friend, Ciara O’Neill, David C Clements, Junior Johnston, Kitt Philippa, Malojian, Matt McGinn, Neil Martin, Rosborough, Son of the Hound, Strange New Places and Susie Blue. The full programme with a further 40 free events will be announced on atlanticsessions.com on Monday, October 15. Third Bar Belfast Artist Development work with musicians and bands from Northern Ireland by investing, mentoring and managing where needed to help them achieve their ambitions. Third Bar is run by Gary Lightbody and Davy Matchett who have curated a very special line up for Atlantic Sessions. Gary Lightbody commented: “David C Clements is one of the most extraordinary voices and songwriters to come from NI in many years. His album, The Longest Day In History, is a masterpiece. It should have been one of the biggest albums of 2016 and he should be playing arenas. He certainly writes songs that would fit perfectly in them. “His next album could be even better and that’s what’s exciting: there is even better to come from him. A terrifying thought really given what he has already written. If you haven’t already heard the album or heard him sing live, then please do. Anyone I have ever turned on to his stuff has thanked me and become a fan for life. Big build up, I know, but I don’t say it lightly. Phil Taggart commented: “The trail of new music is shivering it’s November bones around the coastline to Portrush’s Atlantic Bar on Friday November 16 for my first ever Slacker Night on the North Coast. We have a string of acts that I am very excited about and that I’ve been a fan of and been playing on my shows on BBC Radio 1. “All Tvvins are an incredible act who’ve traversed the globe and are making their North Coast debut at Atlantic Sessions. Full facilitating media node Michael McCullagh brings his musical slide show to town with Son of the Hound, Brand New Friend continue their endless rise as the indie darlings of Northern Ireland while Susie Blue puts the fear of God into the aforementioned acts by absolutely killing it on the first spot. Acclaimed poet Frank Ormsby makes a long-awaited return to Flowerfield for a special Atlantic Sessions 10th birthday appearance – in the company of two of Northern Ireland’s foremost musicians: songwriter Anthony Toner and composer Neil Martin. All three were collaborators on the spoken-word-and-music CD The Kiss of Light, released earlier this year and featuring poems read by Frank and instrumentals composed by Anthony and featuring Neil on cello and Linley Hamilton on trumpet. 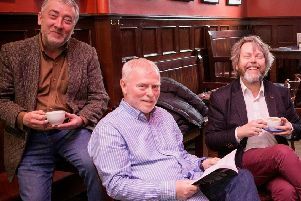 Three of the four are reunited for this special evening of poetry, stories and music. The evening will feature readings from Frank – by turns profoundly moving and laugh-out-loud funny - and a selection of cello-and-guitar instrumentals from the Kiss of Light project, as well as songs from Anthony’s extensive back catalogue, and some gorgeous solo cello pieces and stories from Neil Martin. All of this laced with the kind of easy onstage rapport you can expect from these friends and well-travelled artists. For this special concert as part of the Atlantic Sessions’ 10th birthday, all three will include works with a tang of the salt air about them - Anthony will feature a brand new song, ‘Lost at Sea’, while Neil will play his wonderful rendition of ‘Port na bPucai’, a tune from the Blasket Islands. On January 13th 1968 Johnny Cash performed two of the most important gigs of his life. Much against everyone’s advice at Columbia records, Cash, June Carter, Carl Perkins, the Statler Brothers and the Tennessee Three went to Folsom Prison to record a live album in front of an audience of inmates. His career seem to being stalling, this was a make or break live album. He’d been interested in performing in a prison since his 1955 single Folsom Prison Blues. The 15 tracks on the album released that May came from 13 tracks from the first gig, 2 from the second, Cash had always intended to do two gigs, in case he wasn’t happy with just one. It was pure ‘belt and braces’ approach and even had the blessing of future President, then Governor of California, Ronald Reagan. The setlist included the gallows-humoured ‘25 Minutes To Go’, ‘I Got Stripes’, ‘Jackson’ with June Carter and ‘Greystone Chapel’ written by inmate Glen Sherley, who was in the front row unaware Cash was going to perform his song. The live version of Folsom Prison Blues gave him his first number one single in four years; the album, a number one on the Country charts, top 15 on the national chart. The gamble paid off and was the first of 4 albums he would record in prisons. The Man In Black reminded the world how much of an outlaw he truly was. It has since went 3 times platinum and is considered one of the greatest live recordings in American music history. This year Atlantic Sessions will be marking its 50th anniversary with a special gig recreating that iconic album by Junior Johnson and his band. This will be a unique event not to be missed. His sound is a mix of folk, Americana but also deftly mixed with a psychedelic sound of vintage acts from both sides of the Atlantic, Neil Young, The Byrds, The Kinks, Small Faces and The Beatles. But this is no mere pastiche as his songwriting and vocal style are very much his own. “I’m thrilled once again to curate the much loved Sunday Brunch at the glorious Flowerfield. I go way back with the Atlantic Sessions so getting to hand pick a selection of my favourite artists to play “In The Round” is a real honour that I look forward to every year. I’m always in awe at the sheer amount of musical talent we have in this country and the sheer range of musical styles we produce never fails to amaze me. That eclectic range of sounds is reflected in this years Brunch line up.